In the corner of my home office is a “must read” shelf of novels and short stories, some are ones I want to reread, but most are either new titles or ones I just did not get to during my working career. While many of these I already owned, or buy used from Amazon’s affiliated vendors, I allow myself the luxury of acquiring new clothbound editions written by my favorite writers. Two such recent purchases were Anne Tyler’s Noah’s Compass and John Irving’s Last Night in Twisted River. When I finished my last book, given to me by my wife for Xmas, a wonderful, informative compendium, Geniuses of the American Musical Theatre; The Composers and Lyricists by Herbert Keyser, I debated about my next book, eyeing that new Tyler and Irving title, among the others I had squirreled away for the “right moment.” Impulsively I picked up the John Irving novel. Not sure exactly why, as I really ENJOY reading Anne Tyler, even if she writes about the same flaky characters in their Baltimore environs. Sometimes I feel like I am one of them, an accidental tourist on the journey of life. Enjoyment would not be my motivation for reading Irving; rather, I would call it a COMPULSION and perhaps that is why Twisted River, once in my hands, became the choice du jour. Irving’s characters are not ones I easily identify with so I follow them somewhat dislodged from the comfort zone I am normally within Tyler’s or Richard Russo’s worlds. And, indeed, Twisted River has a panoply of larger than life characters and Amazonian or Rubenesque women, the latter including Injun Jane, Six-Pack Pam, Carmella Del Popolo, and Lady Sky just to name a few of the colorful names. And then there are the men, who are often generically referred to as, “the cook” or “cookie” (Dominick), “the writer” (Daniel), “the riverman” or “the river driver” or the “logger” or the “woodsman from Coos County” (Ketchum), and the “constable” or the “crazy cowboy” or the “crazy cop” (Carl). In typical Irving fashion, there are scores and scores of supporting and minor characters. Irving makes me feel as if I am entering a nightmare; so from the opening pages of Twisted River there is that sense of foreboding. His writing makes me stop here and there to figure out relationships, or potential relationships, as if I’m moving through molasses at times, but he is such a superior storyteller that you are drawn in and the story itself takes over. He paints a portrait of three generations over the last fifty years and in a number of places, Colorado, Iowa, New Hampshire, Boston, Toronto, a twisted river of American life, Irving painting one part of the picture, jumping to another part of the canvas, temporally and geographically, circling and backfilling, bringing the story back to the beginning at the very end. It is an odyssey for the characters and for the reader. As Irving and I were born in the same year, the historical background of the novel is the one we’ve both lived at the same moment of our lives. The political history of “an empire in decline” is an omnipresent part of the novel’s subliminal setting, the arrogance of power from the folly of Vietnam to the Iraqi invasion. Many of the usual Irving themes or symbolism are here: the bears, wrestling, New England, hands (or lack of), tattoos, accidents and fate. But, of all his novels, this may be the most illuminating about Irving himself and the craft of his writing. He even describes his Cider House Rules as another work of fiction in this novel called East of Bangor. Maybe this moment of speechlessness helped to make Daniel Baciagalupo become a writer. All those moments when you know you should speak, but you can’t think of what to say – as a writer, you can never give enough attention to those moments. Childhood, and how it forms you – moreover, how your childhood is relived in your life as an adult – that was his subject (or his obsession), the writer Danny Angel daydreamed…. I particularly appreciated Irving’s attention to Danny’s experience at the Iowa Writers' Workshop. Some of my favorite writers have taught or have been taught there, luminaries such as John Cheever, Philip Roth, Richard Yates, Raymond Carver, Kurt Vonnegut and, of course, John Irving. 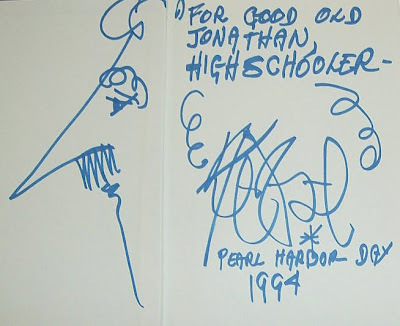 One of Danny’s teachers there is Kurt Vonnegut* a kind man and a good teacher. Describing Vonnegut’s criticism of Danny’s punctuation problem gives Irving the opportunity to reveal the major influences on his (both Danny’s and Irving’s) work: Mr. Vonnegut didn’t like all the semicolons. “People will probably figure out that you went to college – you don’t have to try to prove it to them.” [B]ut semicolons came from those old-fashioned nineteenth-century novels that had made Daniel Baciagalupo want to be a writer in the first place….Danny would be at Exeter before he actually read those books, but he’d paid special attention to those authors there – Nathaniel Hawthorne and Herman Melville…And English novelist Thomas Hardy naturally appealed to [him], who – even at twenty-five – had seen his share of what looked like fate to him. Danny (and Irving), says of his former teacher: Danny like[d] Kurt Vonnegut’s writing, and he liked the man, too. Danny was lucky with teachers he had for his writing…. Ketchum (the woodsman) is an idealized alter ego of Irving, perhaps the man he sees himself as being outside the world of writing, while Danny’s father (the cook), a kindly man, protective of his son, is the idealized father who Irving never met. Irving loves these characters, and the stories of all three men are so tightly interwoven we mourn their aging in the novel as if they are one. But what was political about [his] other five books? Dysfunctional families; damaging sexual experience; various losses of innocence, all leading to regret. These stories were small, domestic tragedies – none of them condemnations of society or government. In Danny Angel’s novels, the villain – if there was one – was more often human nature than the United States. It is well known that Irving works from the end of a story to the beginning and so does Danny: As always, he began at the end of the story. He’d not only written what he believed was the last sentence, but Danny had a fairly evolved idea of the trajectory of the new novel.…That was just the way he’d always worked: He plotted a story from back to front; hence he conceived of the first chapter last. By the time Danny got to the first sentence – meaning to that actual moment when he wrote the first sentence down – often a couple of years or more had passed, but by then he knew the whole story. From that first sentence, the book flowed forward – or, in Danny’s case, back to where he’d begun. And so it is with Twisted River, a work that is a mirror within a mirror as it is Danny Baciagalupo who becomes its author in the end, Irving bringing together all the themes and characters in a coda so powerful that I found myself emotionally choked as I concluded the novel, especially relating to one of Irving’s culminating thoughts: Sometimes, people fall into our lives cleanly – as if out of the sky, or as if there were a direct flight from Heaven to Earth – the same sudden way we lose people, who once seemed they would always be part of our lives. It left me bewildered as to how I could have been so unprepared for such a reaction, other than being in awe of Irving’s gifts and the knowledge that we are all bobbing along on a twisted river, a circle of life.